pie in the sky: Daring Baker: Cakes on a Train! Daring Baker: Cakes on a Train! Nothing about my first post as a Daring Baker is going quite how I planned it. 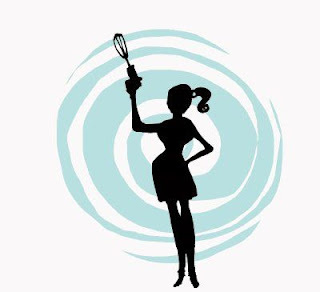 For those of you who aren't familiar, the Daring Bakers are a group of fearless pastry entrepreneurs - there are some 700 of us now - who, once a month, all bake the same thing at the same time. Founded in 2006 by my friend Ivonne of Creampuffs in Venice and Lis of La Mia Cucina, the growing group vows not to reveal the selected recipe until the prescribed date. This month's recipe, proffered by Morven, is Dorie Greenspan's "Perfect Party Cake" from her cookbook Baking: from My Home to Yours (page 250). You can see several hundred versions of this cake over at the Daring Baker's Blogroll! So I haven't told you all this, but I'm moving. Or rather, I moved yesterday; I am currently hunching amid towers of boxes in my half-assembled new home (J and I now share an office, so we're presently sitting at our respective desks, back-to-back). Never fear, neighbors and Brooklyn enthusiasts - we are still proud residents of Bedford-Stuyvesant, Brooklyn...since we only moved five and a half blocks. It's a long story that I won't get into now. But prior to moving, I was packing, painting and panicking, and frankly, party cake was the last thing on my mind. To be fair, I wasn't too enthused about this recipe to begin with. I - don't kill me - don't particularly care for Swiss meringue buttercream (egg whites and sugar are whipped over heat until a marshmallow-fluff-consistency meringue develops, then softened butter is beaten in). I find it a little waxy and...oh, i don't know, butter-textured. I knew that a white cake with the light, perky flavors of lemon, raspberry and coconut would be divinely spring-timey, but I guess I was still feeling wintry here in Manhattan, bundled up in my big coat with a lot of things to do. So I approached this cake with dedication, it being my first attempt as a Daring Baker, but also with a certain amount of brisk, I-can't-be-botheredness that I suppose wasn't really in the spirit of Daring Bakerhood. An occasion to make a cake presented itself - a coworker's birthday - and while I enjoyed the baking and assembly process as much I always do, I think I would have had a better time (and better results!) if I had taken a few moments to experiment (within the strict parameters of DB rules, that is). I didn't do any variations or try anything fancy - this is Dorie's cake all the way. My cake came out beautifully: snow white, sleekly iced, swathed in a coconut scarf, crowned with a ring of plump raspberries. It survived a crowded and hectic subway journey from Brooklyn to midtown under a glass dome, and elicited several oohs and aahs from adjacent passengers. My coworker was appropriately surprised and (I hope) charmed by its appearance. It sliced like a dream, with crisp, elegant veins of jam running perfectly parallel. I served each of us a picture-perfect wedge. Forks clattered and there were a few appreciative murmurs. I describe the Daring Bakers, by way of making conversation. "Wait, you made this?" My boss looked confused. "I thought it was store-bought. Very impressive," he nodded and sidled back to his desk. It was meant to be flattering. But store-bought is pretty much how I would have described this cake too - and the problem I had with it. You see, the pure-white, straight-laced, wax-figure elegance of this cake - which endured virtually unchanged in the refrigerator over the subsequent weekend, store-bought style - lacked that quality that I feel sets a homemade cake apart: ephemeral decadence. There was no toothache-sweet caramel, no dense, moist crumb, no creamy pudding filling - not to mention the absence of wonky icing handwriting and layers all akimbo. This symmetrical white wonder lacked personality and satisfied no particular craving. So I think I learned something about what it means to be a daring baker. It's not about producing some Platonic Form of the recipe; there's no prize for The Perfect Cake. That isn't even very daring! What's daring is to explore new realms of creativity in appearance and flavor. So I made a store-bought cake at home, and I can't wait for next month. Thanks, Daring Bakers! Stick a bright-coloured Post-it to this page, so you’ll always know where to turn for a just-right cake for any celebration. The original recipe was given to me by my great dear friend Nick Malgieri, of baking fame, and since getting it, I’ve found endless opportunities to make it – you will too. 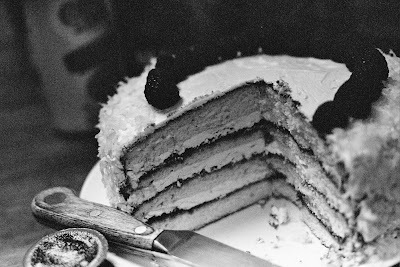 The cake is snow white, with an elegant tight crumb and an easygoing nature: it always bakes up perfectly; it is delicate on the tongue but sturdy in the kitchen – no fussing when it comes to slicing the layers in half or cutting tall, beautiful wedges for serving; and, it tastes just as you’d want a party cake to taste – special. The base recipe is for a cake flavoured with lemon, layered with a little raspberry jam and filled and frosted with a classic (and so simple) pure white lemony hot-meringue buttercream but, because the elements are so fundamental, they lend themselves to variation (see Playing Around), making the cake not just perfect, but also versatile. first, i totally understand your feelings about having something you bake called 'storebought'. it's almost like a backhanded compliment in a way--it's really genuine and well intended, but it still makes the baked good feel soulless and unloved on a personal level rather than just an edible level. second, email me your new address so that i can send you your out of town packet and wedding invite! What? There's no prize? Poo. I get the store-bought thing - that's the ultimate compliment though, from some. Beautifully written, Kate! My mouth is watering ... somehow not having a pic makes it more enticing! Good luck with the move! love the pic of you in the subway. too cute. am intrigued by DB...will have to check it out! You did a fabulous job on your cake. I have to admit to not being all that enthused too, but I did it a second time and really changed the flavors up (Kahlua Carob Cake with Kahlua Mocha Buttercream) and enjoyed it a lot more. Great writing! The cake looks tasty, too bad you weren't super impressed! Welcome to the Daring Bakers!